Making your guests feel at home. 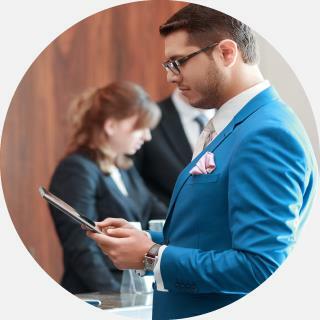 Hotels know that the technologies they choose greatly effect guest experience, can distinguish themselves from other hotels, and ultimately determine the success of their business. Guests are engaging with YOUR hospitality business more than ever before. Whether your guests are calling down for a late-night snack, hosting an important video conference, or calling home to check in, your guests’ phone calls are incredibly important. ATD's customized hospitality solutions are designed to help you with your technology requirements, as well as handle your guests needs with the respect they deserve. By combining beautifully designed solutions, unparalleled clarity and ease of use with exceptional customer service, ATD provides comprehensive technology solutions that pave the way for increased revenue, exceptional customer satisfaction, and supportive branding for your organization. As an industry leader, Mitel has always been THE choice for Hospitality. Mitel hospitality platforms cover a range of VOIP phones, consoles, voice and video conference phones, and peripherals suited for hotels of all shapes and sizes. The Mitel MiVoice Business, Mitel 400, Mitel SX 200 ICP AX are the elite PBX solutions for the hospitality industry. As the global market leader in network video, Axis is driving the industry by continually launching innovative network video surveillance products based on an open platform. Their systems deliver a high value to its customers and carried through a global partner network. ATD is proud to work exclusively with Axis Communications. Axis has long-term relationships with partners and provides them with knowledge and ground-breaking network products in existing and new markets. ATD is a one stop shop for your technology needs. Ask us about the other solutions we offer. The finest hoteliers consider ATD part of their family, as we provide technologysolutions and all-inclusive services to the world’s most recognizable brands including the Marriott, Hilton, Hyatt, IHG and Choice portfolios, as well as a wide variety independent and boutique hotels. Hospitality features are presented as an integrated part of console and telephone user interfaces to minimize training and to ensure staff are always aware of guest needs. Focus on improving guest services and increasing staff productivity with auto attendant, recorded announcements, voicemail, and automatic call distribution. Easy-to-manage platform that integrates with standardized property management systems, hospitality applications, and guest room telephones.